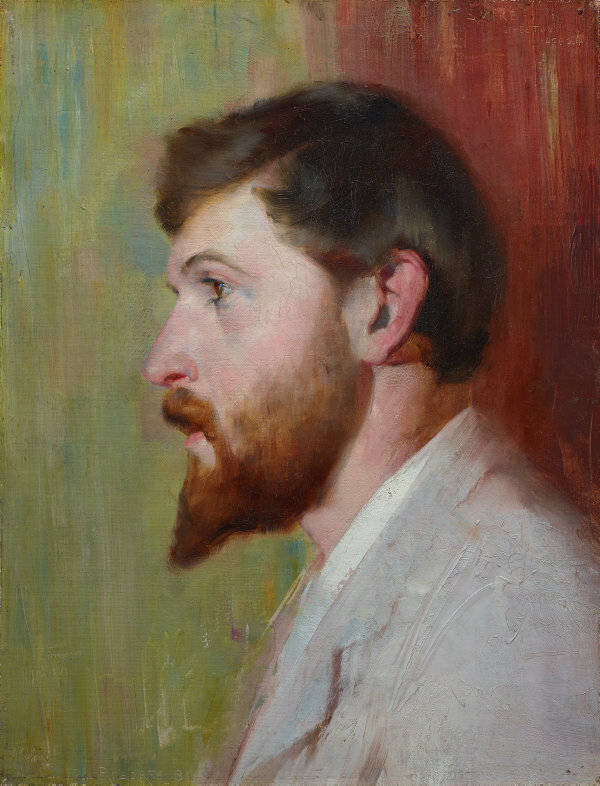 Tom Roberts' portrait of his close friend and colleague Arthur Streeton was made in Sydney in 1891, and Roberts kept it until his death. It is a 'friendship portrait' – informal and highly personal, expressive of the bond of camaraderie and respect between the two artists. Roberts probably painted the oil while camping with Streeton at Little Sirius Cove on Sydney Harbour. Although Roberts is perhaps better known for his grand subject paintings and landscapes during the 1890s, he was also an outstanding portrait painter. Over a third of his artistic output was devoted to portraiture, and throughout his life he largely supported himself through commissions in this genre. Signed and dated l.l. corner, incised "TOM ROBERTS 91.". Leigh Ashtbury, Tom Roberts , 'Masculinity and Modernity', pg. 124, Adelaide, 1996, 138, 139 (colour illus. ), 203 (illus.). Alison Barclay, Herald Sun , 'Artist's secret love', pg. 18, Port Melbourne, 13 Jun 2007, 18 (colour illus.). Art Gallery of New South Wales: highlights from the collection , Sydney, 2008, 59 (colour illus.). Jane Clark, Golden summers: Heidelberg and beyond , 'Sydney Harbour', pg. 151-152, Melbourne, 1985, 154 (colour illus.). 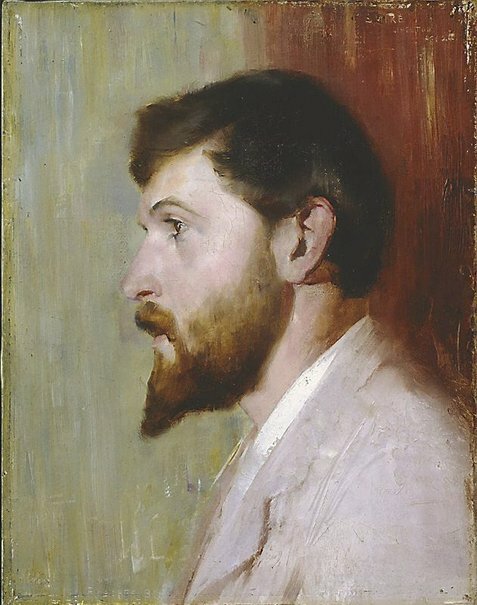 Geoffrey Dutton, Famous Australian Art - Tom Roberts 1856-1931 , Brisbane, 1987, 41 (colour illus.). Uncommon Australians: towards an Australian portrait gallery , Sydney, 1992, 80 (colour illus.). Elizabeth Fortescue, Daily telegraph , 'Love's lasting impress', pg. 84, Sydney, 16 Jun 2007, 84 (colour illus.). Janet Hawley, Good Weekend , 'Tom Roberts Bailed Up', pg. 32-39, Sydney, 24 Feb 1996, 37 (colour illus.). Jeanette Hoorn, Reframing Darwin: evolution and the arts in Australia , 'Tom Roberts' portrait of Charlie Turner and Darwin's expression of the emotions in man and animals', pg. 118-135, Carlton, 2009, 128 (colour illus.). Melissa Iaria, Courier Mail , 'Secret love long lost, but its ghost lingers', pg. 4, Queensland, 13 Jun 2007, 4 (colour illus.). 19th century Australian watercolours, drawing and pastels from the Gallery's collection , Sydney, 2005, 84 (colour illus.). Pat Kreuiter, Look , 'Learning to look at art: Introducing and inspiring art lovers of the future', pg. 12-13, Sydney, Oct 2008, 12 (colour illus.). A group of school children are pictured in front of the painting. Terence Lane, Age , 'Southern lights', pg. 14, Melbourne, 24 Mar 2007, 14 (illus.). Streeton memorial exhibition souvenir catalogue , Sydney, 1945, (illus.). Art of Australia. Vol 1: Exploration to Federation , ‘The only truly representative Australian school of painting’, pg. 357-418, Sydney, 2008, 395 (colour illus.). Daniel Thomas, Art Gallery of New South Wales Quarterly , 'Tom Roberts', pg. 466-487, Sydney, Jul 1969, 469 (illus. ), 471. Robin Usher, Age , 'A Florry of activity', pg. 16, Melbourne, 13 Jun 2007, 16 (colour illus.). Robin Usher, The Sydney Morning Herald , 'Smike ♥ Florry: Streeton's hidden message of love', pg. 11, Sydney, 13 Jun 2007, 11 (colour illus.). Vivienne Webb, Australian art: in the Art Gallery of New South Wales , 'Golden age', pg. 37-38, Sydney, 2000, 38, 45 (colour illus. ), 300.
unknown author, Look , 'Tom Roberts', pg. 14, Heidelberg, Apr 1997, 7 (illus. ), 15 (colour illus. ).